Texas medical license & discipline history. Printer-friendly version of Texas medical license, with brief list of disciplinary history. 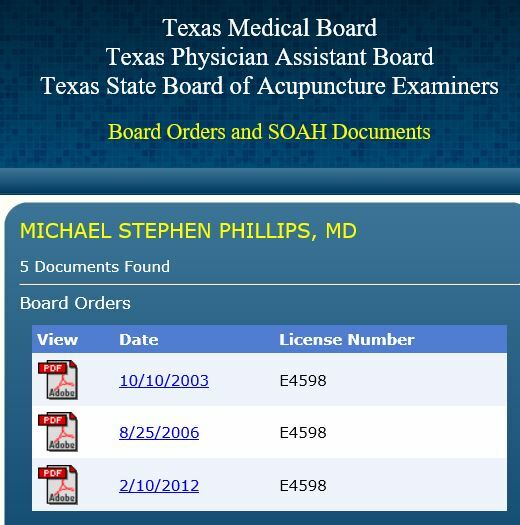 TX State Board of Medical Examiners, Agreed Order - Oct. 10, 2003: Michael Stephen Phillips disciplined by State Board. Board found Phillips' failure to perform proper delivery procedures had caused severe injury and death to three babies. The Board also found that Phillips had misdiagnosed two female patients, resulting in the patients requiring emergency hysterectomies. Board disciplinary actions include the following: Phillips was fined $5000, his medical license was placed on probation for 10 years, he was required to complete 50 hours per year of Continuing Medical Education, and Phillips was banned from practicing obstetrics, prenatal care, or delivering babies for 10 years. TX Medical Board, Modification Order, Aug. 25, 2006: Modification of "chart monitor" requirement in original Agreed Order dated 10-10-2003. All other disciplinary provisions of Agreed Order remain in effect. TX Medical Board, Modified Agreed Order, Feb. 10, 2012: Board had placed Phillips on a 10-year probation, and prohibited him from practicing obstetrics. Phillips violated his probation by performing an abortion on 5-23-2011. The Board fined Phillips $1000, and continued his probation until Oct. 10, 2013. Complaint against Michael Stephen Phillips from the TX State Board of Medical Examiners, Apr. 24, 2002: Complaint gives details of obstetrics failures by Dr. Phillips, which caused injury or death to multiple infants, and severe injuries to female patients. Order #19 Dismissing Case, Oct. 27, 2003: TX State Board of Medical Examiners filed a motion to dismiss their case against Michael Stephen Phillips, because the Board had already issued an Agreed Order against Phillips, which placed him on probation for 10 years.